For those who want classy elegance in their compact cars, this is the option you do not want to miss out on! 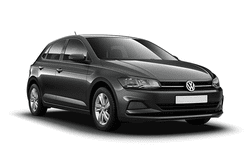 The Volkswagen Polo combines a comfortable ride with secure handling and has one of the classiest interiors of any supermini on the market today. With a 5 door and 5 seat set up you will have plenty of room for anyone and anything you need to take with you on your next grand adventure. With great fuel efficiency, powerful engine, and advanced safety features, you will have a blast driving the Volkswagen Polo. There is no need to give up comfort inside for a classy look outside- you get them both and even more with this compact ye powerfully impressive supermini!